The Original Shrine is the centre of a worldwide network of shrines – the 200 daughter shrines with their own network of shrines and wayside shrines, and extending to the home shrines and shrines at work places, places of apostolic commitment, and the various circumstances in life, and reaching even to the heart shrines. When pilgrimage routes connect shrines, and people communicate through the covenant of love from heart shrine to heart shrine wherever the Pilgrim Mother, as the model for the missionary current, travels from a shrine, a network comes into existence that spans the whole world. Then distance plays an ever-decreasing role and each one can enter into contact with everyone else in real time. A culture of heartfelt personal bonding is created. Cultivating this network of shrines centred on the Original Shrine, from which all the graces pour out and to which all the graces flow in return, is the aim of the Year of the Shrine Current. Everything has originated at Schoenstatt and all our pilgrim ways ultimately lead back to it, so the new enthusiasm which grips us all for the importance of the Original Shrine for our times as a place of grace and the presence of a saint in our midst, as a place where God and nations meet, and a place of missionary enthusiasm, fills the Year of the Shrine Current with deeper meaning. That is the strong incentive that leads our worldwide Schoenstatt Family from the Year of the Father Current into the Year of the Shrine Current. It is the year in which we look with our Father, Founder and Prophet at the foundations of our covenant of love as our mission, and try to deepen these foundations. The tiny, unspectacular, perhaps even less than elegant, shrine that was born in Father Kentenich’s heart at his consecration as a nine-year-old, and that took shape and form on 18 October 1914, is our “piece of paper” towards which the eyes and cameras of the world must be directed when we celebrate the centenary of the covenant of love – all of us together. A single shrine that embraces the whole world; a single shrine that heals and sanctifies the world – our globalised, secularised and de-personalised world – because a network of shrines has spread over the whole world; because unseen people on the roadside, in the heart of the city or town, at work, in prisons, hospitals, orphanages, homes for the elderly, churches, war zones, and sunk in utter poverty … walk up to the open doors of a shrine. It could be built of stone, it could be a wayside shrine, a home shrine, or a heart shrine, yet it is a shrine that is global, connected to a network, without boundaries, and utterly person-oriented. It is a shrine that in any of its forms is a place where we encounter God, a place of evangelisation. Each shrine, from the Original Shrine to each heart shrine, lives from the contributions of each individual person and the whole Schoenstatt Family. It is a shrine where life becomes the Gospel and the Gospel becomes life. 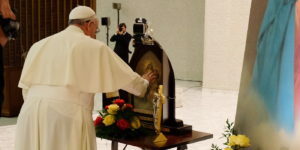 As if this worldwide network were not enough, the Mother Thrice Admirable goes even further, she goes out from the shrine to the people as the Pilgrim Mother of God. This leads us into the missionary current. “We are united in the shrine where the flames of our hearts beat for our Mother Thrice Admirable who, through us, wants to build your kingdom,” prayed Fr Kentenich, not 700 meters below the surface of the earth but in the concentration camp at Dachau. We are fine in the shrine – all of us together: all generations, all nations, all communities, all projects, all the people who live the covenant of love. As a result Schoenstatt began to develop a presence and formative power as a living shrine: right at the beginning, on 18 October, in (every) Dachau and on the way to the jubilee of the covenant of love, our mission. The world, the people who wait for what the good God through Fr Kentenich has to give, have to encounter and experience a living shrine in Schoenstatt – in each individual member and in the whole worldwide Schoenstatt Family – and be able to say: We are fine in the shrine – all of us together. At the end of the Year of the Shrine Current, Schoenstatt, the world, the actual world that each one of us forms and moulds, must have increasingly become a shrine.